Pushkar, the city often referred to as the ?rose garden of Rajasthan? is a city of culture and intellect. Nothing can describe this iconic city better than a sought-after destination that provides the essence of Pushkar roses, the charm of culturally vibrant atmosphere and the dynamic festivities make it one hot cultural spot. The west wind of Pushkar gives an easygoing vibe of Westwood lifestyle in the hot sandstone town. The home of the only temple dedicated to Lord Brahma in the world, it is one of the ultimate pilgrimages for Hindus to attain divine spiritual bliss. A place of holy spirit for Hindus, ample ghats are flooded with devotees, closing eyes in the serenity of chants coming from temples around. 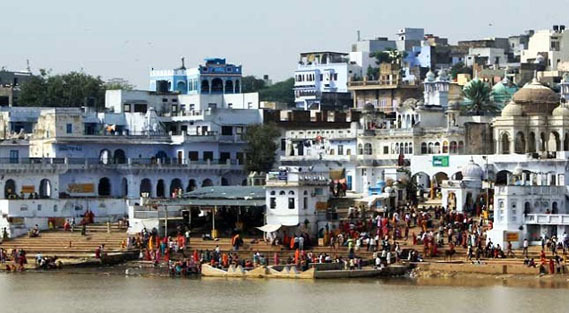 A soothing and calm place with the glitter of spirituality makes Pushkar a must visit. Pushkar is one of the oldest cities of India and is one of the five sacred dhams for devout Hindus. It has one of the very few existing devoted temples to Lord Brahma. Pushkar is also famous for its annual Pushkar Camel Fair, held in the month of November. This is one of very few places in Rajasthan you would find which isn't famous because of a fort. This holy city attracts tourists from far and wide for its many temples. Even though Pushkar is a deeply religious destination, it has become a hipster's paradise in the last few years. A number of cafes with a relaxed and chilled out vibe serve delicious, authentic vegetarian Indian food, and you can sit and observe the life in small-town rural India, and appreciate Hindu religious traditions. However, one has to be a little sensitive towards the its religious and spiritual significance, respect local norms and keep from consuming meat products or liquor in and a little around Pushkar. The annual five-day camel and livestock fair, held at the bank of Pushkar Lake in the town of Pushkar is one of the world's largest camel fairs. Apart from buying and selling of livestock it has become an important tourist attraction as there are various competitions like "matka phod", "longest moustache", and "bridal competition" which attract thousands of tourists. A camel race starts off the festival, with music, songs and exhibitions to follow. Perhaps one of the major tourist destinations in India which attract both Indians and foreigners equally, Pushkar lake is perched amidst the Aravalli ranges in Pushkar, Rajasthan. Surrounded by 52 bathing ghats and over 500 temples, it is regarded as the sacred lake for the Hindus in India where pilgrims throng in large numbers to take a holy bath. According to Hindu theology, there are five sacred lakes collectively called Panch-Sarovar namely- Mansarovar, Bindu Sarovar, Narayan Sarovar, Pampa Sarovar and Pushkar Sarovar. Amongst these, Pushkar Sarovar or Lake is the most significant. The pure and pious aura of the place is amusing and is a must visit place if you want to know the gist of Hindu religion. Located in the oldest city of Pushkar which is often called as 'Tirtha-Raj' or the king of pilgrimage, the existence of the lake takes us back to the 2nd century BC. The lake witnesses millions of devotees flocking here because of the belief that the famed waters of the Pushkar wash away the sins of the whole life. The scriptures also mention that doing a parikrama of the three lakes- the main Pushkar, Madya Pushkar where there are a Hanuman temple and an old Banyan tree, and Kanistha Pushkar where a Krishna temple exists during the Kartik Poornima day would be highly auspicious. On the holiest day of Kartik Poornima, a dip in the lake is considered equal to the benefits accrued by performing yagnas (fire-sacrifices) for several centuries. The nearby temples like the Brahma Temple increase the sanctity and purity of the ambience. The Pushkar Lake holds an utmost religious significance for Hindus and is a perfect example of strong belief in their religion. The largest and the most ancient temple of Pushkar, Varaha Temple is dedicated to Varaha The Boar which is the third incarnation (avatar) of Lord Vishnu. The Varaha temple houses an image of lord Vishnu in the incarnation of wild boar. Merta is an old city. Meerabai, the very famous poetess and devotee of Lord Krishna was born here. This town is a religious hub of Hindus. Charbuja Temple which lies in the city center is a paramount and famous attraction of Merta. It has witnessed numerous battles since it was ruled by Rajputs, Marathas, and Mughals. After one of these battles had taken place, Aurangzeb constructed a mosque over the ruins of the Shiva Temple which is another famous attraction of the site. Merta was a vital kingdom under the reign of Mertia Rathore Rajputs. After some time, Rao Maldeo Rathore of Jodhpur who was the head of the Rathore clan attacked Rao Veeramdev of Merta out of jealousy. Veemramdev joined Sher Shah Suri and asked him to attack Jodhpur. As a result of this attack, Rao Maldeo left Jodhpur along with his army and joined Delhi Sultanate. Rao Veemramdev was succeeded by his son Rao Jaimal. When Akbar attacked Mewar because of its refusal to give away its women to the Mughals, Rao Jaimal died fighting the battle. After this, Merta was merged with the state of Jodhpur and all his sons were given some portion of the nearby principalities. The Gurudwara was made to commemorate the visit of Guru Nanak Dev to Pushkar. This place is also known as the Guru Nanak Dharamshala. Savitri temple is located atop the Savitri Hill. The one and half hour climb to the temple is hard and strenuous. Both, idols of Brahma's first wife Savitri and his second consort Gayatri are present here, though Savitri is always worshipped first.